3 868 033 ha of high forest. 1 444 000 ha of high forestry, 37.3 percent of the national high forest coverage. 96 500 ha on plains (4.2 percent). 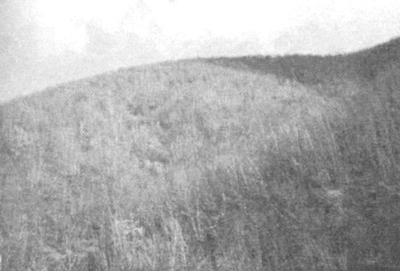 Except for some small surfaces that are in plain zones, other coppice is at the foot of mountains at an altitude above sea level varying from 300 m up to a higher vegetation limit, with average sloping over 35 percent, often characterized by an uneven terrain (see Photo 1). The forestry main roadnet, according to a study carried out in a sample region, varies from 5 to 40 m per hectare, and access for forestry utilization is difficult because these roads were made to perform functions other than the forestry one. There are no certain data about the secondary roadnet, but if the old paths are reopened (see Photos 2 and 3) as roads, there will be a density value up to 15–50 m per hectare. However, we are talking about values that are lower than those advised by forestry technicians and found in the rest of Europe. The reality in south-central Italy is very different from the national average, values decreasing to 4 to 13 m per hectare for the main roadnet density, and there are no certain values about the secondary forestry roadnet. Their practicability is difficult. From this analysis a reality emerges of diverse forests with a negative stumping price, also resulting from unsuitable work methodologies. 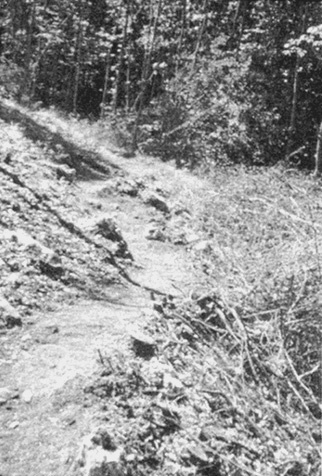 To assure the utilization of these forests, the roadnet must be increased and the woodcutters must work with proper techniques and technologies. Such strategies increase stumping prices and make economically possible the management of those “marginal coppices” otherwise left in an advanced state of degradation with repercussions on all their efficiency functions. 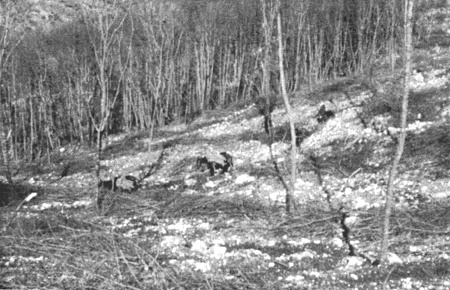 Today the utilization of coppice in south-central Italy is done by cross-cutting trees in the forest and stacking wood according to size (see Photo 4), because the cutting and cross-cutting concern is different from that transported primarily by tractor or mule. We believe, on the evidence of other studies, that this methodology is too expensive because it involves cross-cutting of coppice shoots 1 m long on sloping and uneven surfaces and a double sizing of firewood. 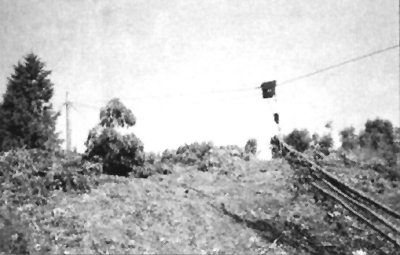 In this case study two forestry yards were analysed, where two extralight cable systems were tested, one with a semi-automatic carriage loading of 1.5 tonne (see Photo 5), the other one with a carriage loading of 1 tonne (see Photo 6), moved by one dumb forestry which loading 4 tonne, applied to the hydraulic lift-linkage of a farm tractor. 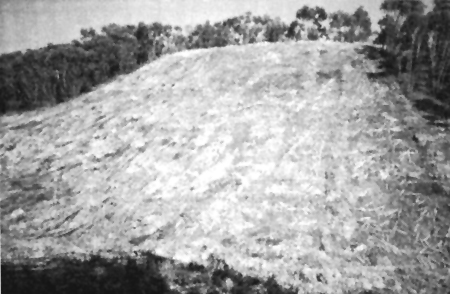 The yard where the two skylines were assembled was located in a turkey oak coppice in central Italy (Grosseto, see Figure 1). The second one, where three skylines were assembled, was in a eucalyptus coppice in southern Italy (Crotone). 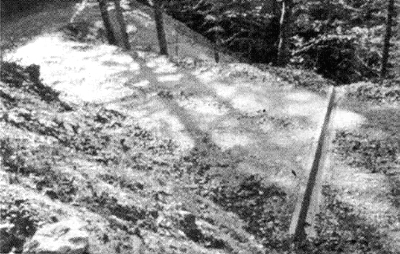 The morphology, similar in the two yards, is characterized by slopes increasing up to 25 to 40 percent and not really uneven, with soil texture calcareous-argillaceous, an erosion hazard. In total, experimental tests were done on the five skylines: each one has left-to-load wood on a surface between 0.3 and 0.5 ha. Table 2. 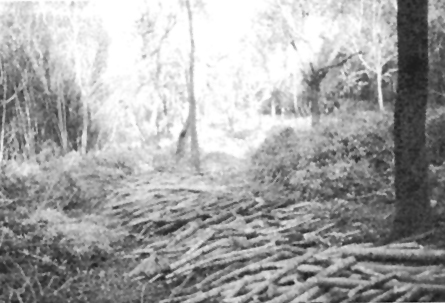 Average parameters refer to hectares and to each coppice shoot of Eucalyptus coppice, in average 20 years old. 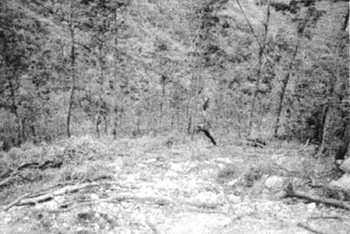 All cutting operations were executed by chainsaw, steering felling so as to have the bottom of the tree in extraction wood direction (see Photos 7 and 8). 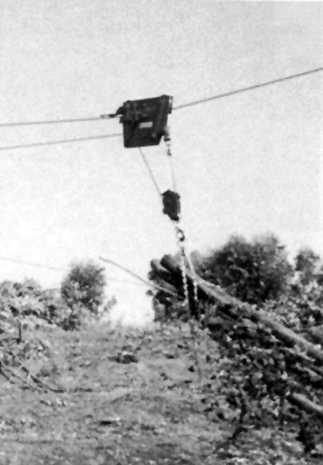 Wood extraction was done with two extralight cable systems, one with a semi-automatic carriage loading 1.5 tonne, the other one with a carriage loading 1 tonne, moved by one drum Krpan forest which polling capacity of 4 tonne, applied to the hydraulic lift-linkage of a tyred farm tractor by 50 kW (see Photo 9). In both yards the coppice shoots were full-tree extracted then, at landing, they were processed (see Photo 10). Total work time is given on the grounds of a harmonized protocol, written by a European workgroup for the study in the forest (C.A.FAIR GCT 98–4421). Inoperative time, divided into several subjects, representing those moments in which man and machine are physically stationary and not employed in any type of work. The record of the work time data required the use of chronometrical schedules provided with three mechanical chronometers, with divisions to the hundredth of a minute (1" = 10-2 min), one of which has a totalizer function (to record the gross total work time of the whole work day), while the other two record the partial times (to record the times of different stages of the work and the dead times). The data were also recorded on pre-printed schedules in different columns, with the worker's number and data regarding different stages of work. The productive hours, because of work times and to the materials used, were processed by teams and per worker. gross average hour productivity, calculated according to the total time. The crop data were recorded by means of tree callipers and metric rollers used in international measuring systems. In the laboratory we determined the different weights and density of wood. 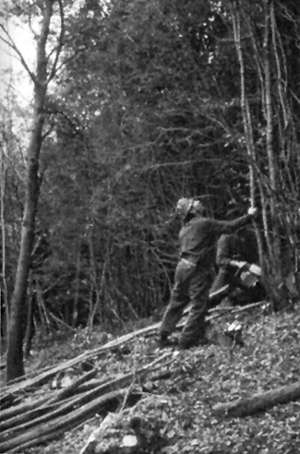 In the turkey oak coppice two skylines were assembled 80 m in length with a 35 percent sloping average (see Photo 11). 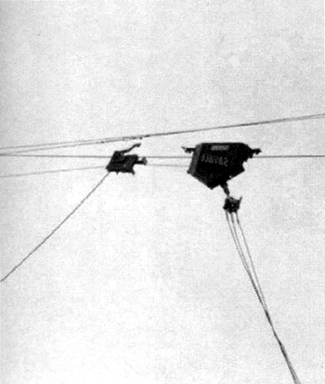 A semi-automatic carriage was used of 1.5 tonne. In unloaded areas we built a support “A” (see Photo 12) to keep the shunt block and the skyline high above the ground. 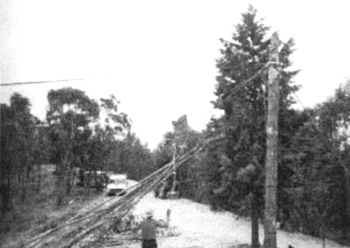 The side skidding distances vary between 0 and 45 m, while the carriage returns vary between 10 and 30 m.
In the eucalyptus coppice, three skylines were assembled 105 m in length with a 30 percent sloping average, and a simple 1 tonne carriage was used. In the upstream unloaded area we built a strut, made from a 6 m length pine trunk, to keep the shunt block and the skyline high above the ground (see Photo 13). This was done because there was no presence of high trees, therefore, more time was employed in assembling and disassembling the skyline, compared with the first experience. The side skidding distances vary between 0 and 25 m, while the carriage return distances vary between 15 and 70 m (see Photo 14). From the comparative study of the five line trends shown in Figure 4, representing the trend net productivity in function of the total, we can see that, although with different trends in the five different areas, productivity decreases with increase of bunching and extraction distance. 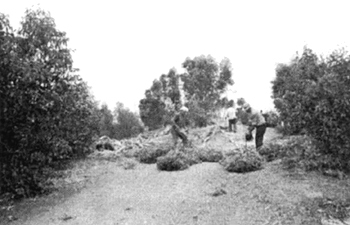 Moreover, the structural differences between two yards became evident vis-à-vis work distances, probably because of those differences a lower productivity was recorded in eucalyptus coppice. We also noted the two lines that represent first two-skyline assembly in the two different yards. As can be seen, productivity is lower owing to operator inexperience with such technologies and the non-ideal number of operators per team. 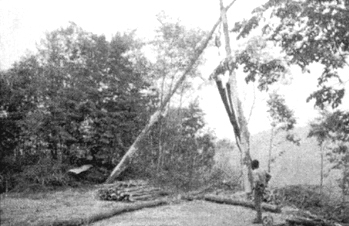 Full tree processing by chainsaw of short trunks 1 m length (firewood) and relative manual stacking in landing (see Photo 10). 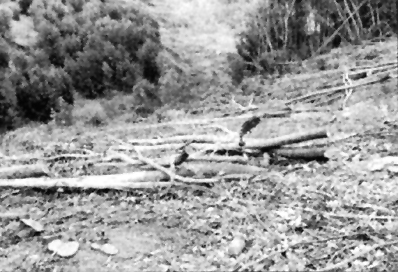 Firewood 1 m length extracted by mule and manual stacking at landing (see Photo 17). Regarding cost analysis, it could be wrong to keep the first line as reference and assembly in the eucalyptus coppice, because of the inexperience of the team and to the low sloping of the line. Moreover, very low productivity has been recorded, compared with the other yard, with relative cost increases for cubic metre. For the other line costs remain lower compared with traditional utilization methodologies, from 24 up to 32 €/m3 against 39 to 42 €/m3. Regarding the productivity examination, productivity per worker in turkey oak, Line 1, is greater compared with the second one in which there was one extra operator. This makes it possible to achieve lower costs. Therefore, it is ideal if the team is made up of three workers. The new bunching and extraction technologies and methodologies tested are competitive compared with traditional methods, without considering the lower surrounding impact - especially with respect to soil - when compared with one of the most natural extraction methods, such as the mule. Full tree extraction methodology is quite effective in the case of chip production in landing instead of firewood production. Moreover in high fire risk areas, the removal of slashes is an efficient fire-prevention methodology. ARMEF, CTBA, IDF. 1993. Manuel d'exploitation forestière. Bagnaresi, U., Baldini, S., Berti S., Laruccia N., Pelleri, G.F. & Vianello G. 1988. Ricerche sui fattori di marginalità delle risorse forestali in un bacino dell' Appennino romagnolo, Genio rurale n. 7/8. Baldini, S. & Garavoglia, S. 1987. The use of farm tractors in thinning extraction operations. Workshop proceedings. 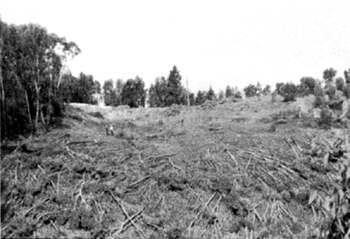 Small-scale logging operations and machines. Baldini, S. 1989. Potenzialità e possibilità di recupero della biomassa forestale in Italia. Accademia Economico Agraria dei Georgofili. Baldini, S. & Berti, S. 1989. Viabilità forestale e accessibilità dei boschi, sistemi agricoli marginali, Mugello, Alta Romagna, Garfagnana, Alto Reggiano. Baldini, S., Bernabei, M. & Picchio, R. (In prep). Harvesting of eucalyptus plants with simple methods and analysis of the chips obtained. International conference, Eucalyptus in the Mediterranean Basin: prespectives and new utilizations", C.N.R., I.U.F.R.O., Taormina-Crotone, Italy. Ottobre 2000. Cheremisinoff, N.P & Ellerbusch, F. 1980. Biomass: application, technology and production. Dekker Inc. N.Y.
FAO. 1996. 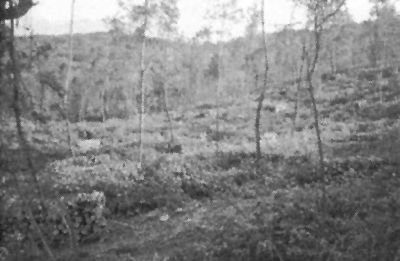 Code modèle FAO des pratiques d'exploitation forestière (FAO model code of forest harvesting practice), by D.P. Dykstra and R. Heinrich. FAO, Rome. Giordano, G. 1956. Tecnologia del legno. Enciclopedia UTET. Hippoliti, G. 1997. Appunti di meccanizzazione forestale. Studio Editoriale Fiorentino, Collana Universitaria. Hippoliti, G. & Piegai, F. 2000. Tecniche e sistemi di lavoro, la raccolta del legno, compagnia delle foreste. Marchi, E. 1997. Le gru a cavo nel settore forestale: aspeti tecnici e classificazione. Sherwood - foreste ed alberi oggi, No. 20: 2/97. Robert, P. 1984. De la foret aux chaufferies à bois à alimentation automatique. Agence Francaise puor la Maitrise de l'Energie, I.D.F. Rotaru, C. 1990. Les couloirs d'exploitation par cable role et importance. C.T.B.A. Staaf, K.A.G. & Wiksten, N.A. 1984. Tree harvesting techniques. Forestry Sciences. Zanuttini, R., Castro, G., & Berti, S. 1998. XYLOGLOS (multilanguage glossary of terms used in wood technology). CNR IRL Firenze.